It’s been quite a while, but at last I’ve updated my MOTHER 3 translation notes with a new section! This time, we take a look at the search for Hinawa and everything leading up to the famous Flint freakout scene! It’s not EarthBound-related, but while I’m at it I should mention that I also recently updated my Final Fantasy IV comparison stuff with a new page – see it here! 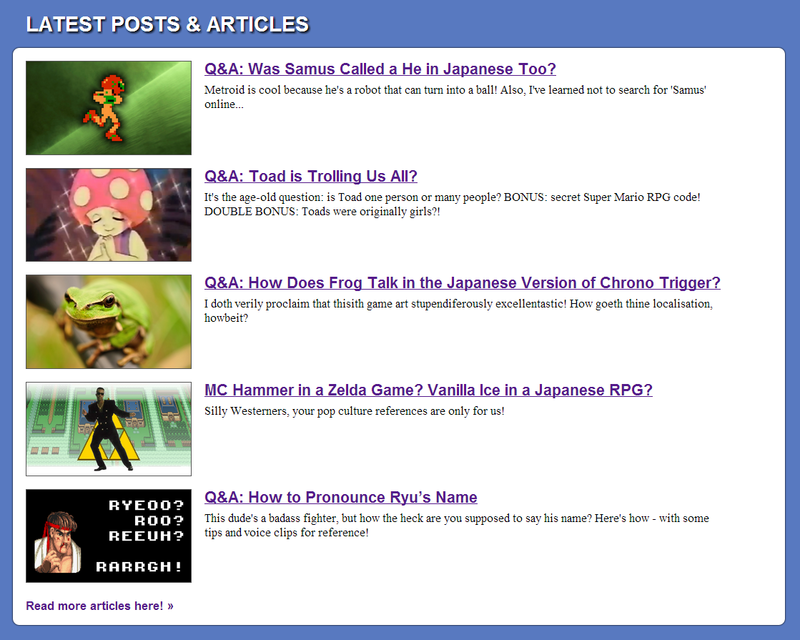 Actually, I take that back – there IS EarthBound stuff on that page after all. I just can’t seem to escape the game! Anyway, at this point I really want to get started on book versions of my localization projects. I want to start with something small as a sort of test run, but I don’t know what game/project that should be. But given that it’s been taking me so long to get these MOTHER 3 notes going, I feel like making a MOTHER 3 is the only way I’m going to get through the game without taking 10 years. But it also feels like “selling out”, so I dunno, if you guys got any suggestions, let me know in the comments or e-mail. Besides my EarthBound Central updates here, I’ve also started posting game localization-related articles on Legends of Localization. You can follow my wacky hijinks there and at @ClydeMandelin on Twitter! If you do release these notes as a book, make sure you also release them in eBook format so us Brits don’t have to pay a fortune for shipping! Yay! I look forward to reading this. I really love Legend of Localization, and it’s especially interesting following the Mother 3 one considering it’s your translation. About the “selling out” thing… well, I sent you an email about that last night. Basically, I think people are WAY too quick to call others out on what they THINK is selling out. I would totally buy a Mother 3 Translation Notes book. I don’t see why it would be “selling out”. I’d say, do it. I think most people here will agree that it would hardly be selling out considering the immense amount of work you’ve done with zero compensation from anyone. 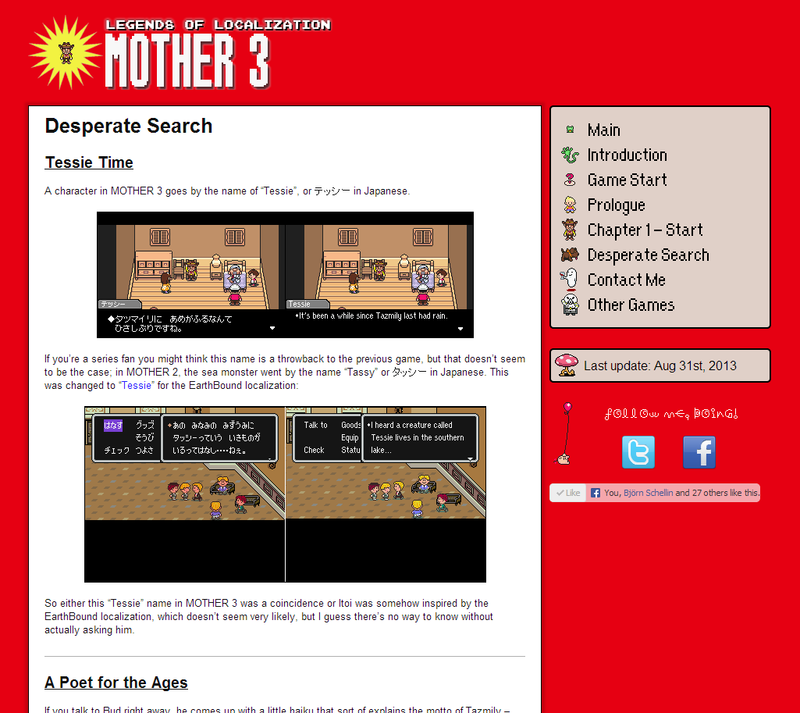 I’d be more than happy to pay for a book of Mother 3 notes, especially if it meant getting them that much sooner! Personally I possibly would have taken a route like using lyrics from the Fresh Prince of Bel-Air. “I’d like to take a minute, just sit right there,” or a line like that somehow. Something well-known enough that it won’t fly over Americans’ heads or seem like a normal line of dialogue. Stuff like obscure lyrics can be a pain to localise, and with that line so out of the way, it really isn’t a problem you just translated it as-is considering most players would possibly never encounter it. I don’t quite see it as being a “sell out”. This stuff really takes a lot of effort and, previously, you had a donate page to have visitors contribute to your localisation notes. Planned on donating more for the Mother 3 notes. Before it disappeared I went ahead and pitched in like $10 and planned to throw in more after my paycheck that week. Still, if you charge enough and generate enough buzz you should be able to make a reasonable amount of cash for how long you work on it, and seeing today’s page your Mother 3 notes are THOROUGH! Each chapter would be like 1/4 of a chapter from the game in book format or something. I would buy a book on these notes in a heartbeat. I’ve been wondering for years if Jackie and Tessie were references to the EarthBound localization, but I’m happy and surprised to see it’s their real names! I always assumed Innit Tea was the contraction of “isn’t it,” so maybe that’s why no one asked about it. But I always like saying it. As I always say, do whatever you want. I don’t see it as “selling out” because this isn’t just some quick money-making scheme. 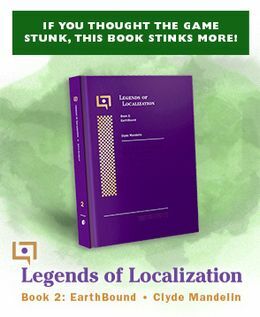 Since people genuinely want it (myself included), making Legends of Localization books is really more like a cool and fun experiment than some “Hey, I just want your monies and stuff! !” thing. That last part sounded better in my head. Also, for the haiku thing, couldn’t you have made him say “Receiving help from others”? That’s seven syllables. Mato selling out. Bwahahahahah! Oh good one… Oh, you’re seriously worried about that. Well, the Internet is a hive of retched scum, so I can see why you could be worried. I’d buy a book of your translation notes. Just posting to say thanks for the latest lengthy updates. The whole site is really interesting, so thanks! Who thought they screwed up killing her so early?? I don’t think the game would have worked without that death so early! It’s actually a common complaint I see, usually from people who wanted to see what the hype about the game is. That’s so bizarre, it’s the catalyst for the story, not the climax of the story! The whole game wouldn’t make sense without the sudden, if not violent, shattering of their peaceful world. That’s such an odd complaint, though. Hinawa’s death isn’t important because we care about her so much. It’s important because of the effect it has on other characters (and the town). That’s like complaining about Nemo’s mom dying at the beginning of Finding Nemo. Mato, when’s the next section gonna be added? I’m not really sure yet – I need to come up with a better game plan for Legends of Localization first but haven’t settled on anything yet. So right now the major section updates are sort of floating in limbo.